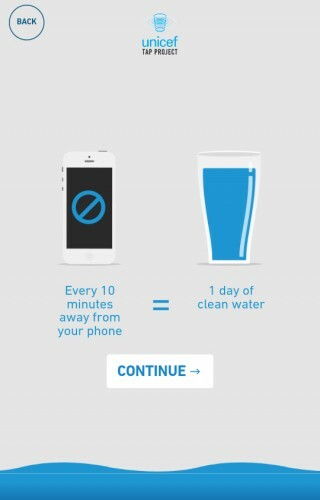 The project raises awareness about the insane amount of time we waste on our phones, while also doing good. 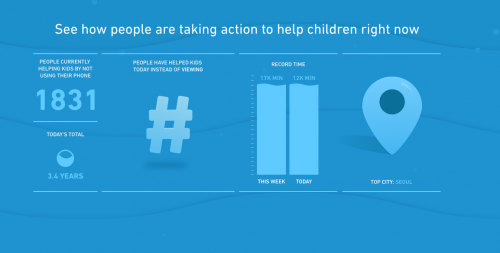 UNICEF’s new social media project will bring a child one day’s worth of water, but only if you step away from Candy Crush and Twitter. 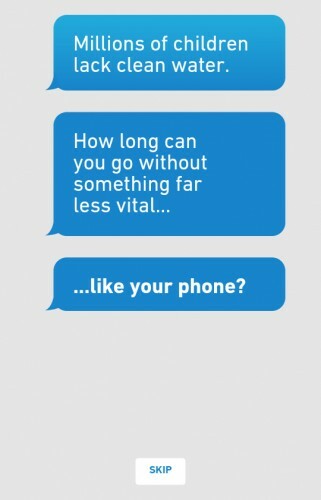 The campaign, called the Tap Project, records how much time passes without your phone being use. Every ten minutes, the web app registers one unit, and one day’s worth of water donated by sponsor Giorgio Armani‘s Acqua for Life foundation. Water for a day may seem like it would add up to huge expenses over time, but in reality only $5 can give children clean water for 200 days. Talk about a perspective shift. The mobile app not only tracks the time you’ve spent pining for your phone but also provides surprising (and somewhat frightening) statistics about social media use. Today, 1,831 people are taking the challenge. They’re going without their phones instead of posting 9,000,000 selfies; posting 746,000 cat photos; 3,023,000 Facebook photos. So far, the app’s top donation city is Seoul, but New York holds the record for longest time without a phone (17,000 minutes). The project ends on March 31st, so visit the Tap Project to start donating.